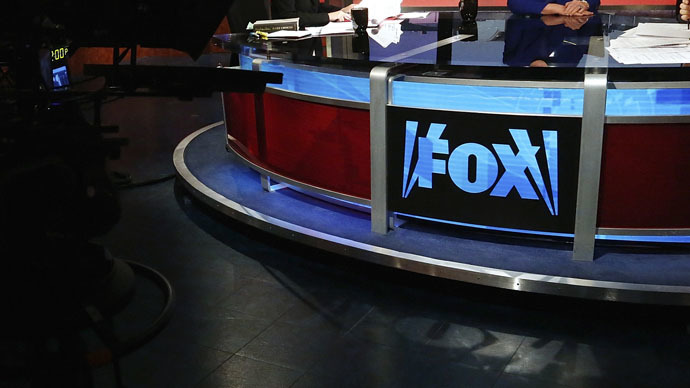 The former employee of a Fox affiliate in Texas committed suicide outside Fox News headquarters, blaming the network for ruining his life. He claimed he was fired over a "sensational" Facebook post about the Austin police chief. The man, identified as Phillip Perea, handed out fliers in front of News Corporation headquarters Monday morning that said his former employer had “ended my career” and that the news channel had ruined his life, a police official told the Wall Street Journal. The 41-year-old had previously worked at a Fox affiliate in Austin, Texas. About an hour before his death, Perea tweeted criticisms of his former employer, and linking to one of his 35 YouTube videos railing against Fox News.The videos in ‘The American Workplace Bully: How FOX News Ended My Career’ playlist “paint the picture of a disgruntled former employee who he believes was outed as part of a master plot against him,” AOL News reported. The eight-minute video Perea linked to in his last tweet laid out his complaints against the channel, which he believed unjustly fired him over a promotional Facebook post. Perea was a promotion producer at Fox affiliate KTBC, and teased a story on Facebook in February involving a viral video of the arrest of a jogging jaywalker. Jogger Amanda Jo Stephen was wearing headphones when Austin police stopped her for jaywalking. They demanded she provide identification, which she wasn't carrying. A nearby student videotaped her arrest, and the footage quickly went viral. Afterwards, at an unrelated press conference, Austin Police Chief Art Acevedo said, "Cops are actually committing sexual assaults on duty so I thank God that this is what passes for a controversy in Austin, Texas." In the Facebook post, Perea combined a picture of Stephen crying with a photo of Acevedo reacting to questions about the viral video. Perea’s bosses at the station thought the photo of Acevedo was “more sensational than informative” ‒ in part because the police chief didn’t like the image, the Austin Chronicle reported. They also believed that Acevedo hadn't agreed to an individualized interview with Fox since Perea posted the photo, which KTBC had deleted. "He was so offended by that, that we're on the outs," KTBC Vice Presi­dent and General Manager (as identified by Perea) apparently told Perea in a recorded conversation. "He won't come on our station anymore." Lewis said that Acevedo was letting Fox sit in and record group media interviews, but avoiding one-on-ones – and added that the photo had made Acevedo "look like a buffoon." The producer was set to be suspended three months later due to the incident, as well as alleged inappropriate behavior and an alleged general inability to follow directions, according to the Chronicle. Perea was fired in June, according to a statement by Fox Television Stations. The first video in the playlist was published July 2. The YouTube videos include secretly recorded conversations with Lewis saying that other employees "feared" Perea and that he made them uncomfortable, according to the Daily Kos. He was ultimately fired for "unprofessional behavior," though he believed it was actually because of the conflict over the Acevedo Facebook post.